MAN OF THE HOUR: "Life is a question; how you live your life is the answer," says Brown, who shared his own journey of rags-to-riches and finding his power. FROM seven doctors, he heard three words no one wants to hear: You have cancer. And before they knew it, the cancer had metastasized to seven different parts of his body. Les Brown decided that seven was his lucky number. But on the flip side, he knew that being diagnosed with prostate cancer was no laughing matter. “Things are gonna happen to you that you never see coming, but you’re more than a conqueror. So that cancer was gonna get the heck beat out of it,” Brown said, as he addressed the scores of Jamaicans who flocked to the Jamaica Conference Centre on Saturday to hear him speak. We were not disappointed. 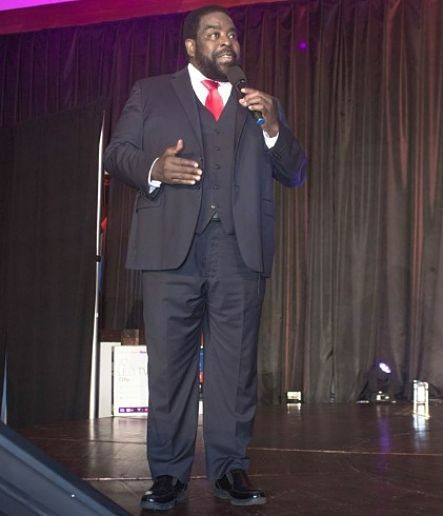 Les Brown is like a preacherman, only smoother, combining spiritual wisdom, powerful rhetoric, humorous anecdotes and true-to-life testimony to hold his audience riveted – and taking notes nonstop. The nearly two-hour long talk from this icon, considered “the world’s best motivational speaker,” was riddled with applause and drew a standing ovation at the end. He’s seen it all and done the rest. Long before he beat cancer, Brown was born in an abandoned building in New York City, subsequently adopted and cared for by the world’s kindest mom and placed in a school where he was labelled a retard. But Brown had ambition and goals like one day buying his mom a house. “My first dream was to buy groceries for my family and buy clothes nobody had worn before,” he remembers. Fast-forward several years later and he gets elected to the Ohio legislature. Today, at 72, he’s the father of close to a dozen children and an in-demand motivational speaker who’s graced some of the biggest stages in the world. “Those times I went through I’m glad I didn’t give up,” says Brown, who was scorned as a boy when he contracted diphtheria. “Massive success,” he says now, is the best revenge. “Life is a question. How you live your life is the answer. If you do what is easy, your life will be hard. If you do what is hard, your life will be made easier,” he says.